Over the last few months, I’ve been part of a research team commissioned by the Scottish Government to explore the case for a new approach to performance management for the planning system. Instead of the current focus on processing speed the emphasis would shift to better understanding the contribution of planning to building a better Scotland. The team was expertly led by John Lord of Yellow Book, the main author of the report and this article (previously published in The Scottish Planner, October 2018, pages 4-5). 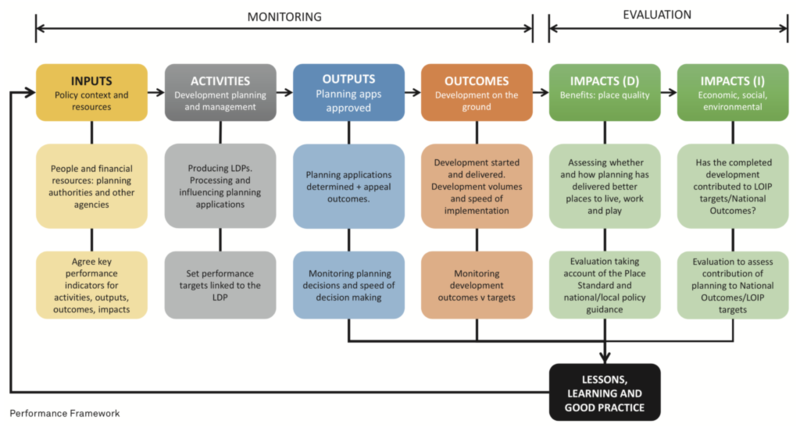 The article considers the implications of rethinking planning’s monitoring and evaluation framework, and the potential benefits in terms of learning, transparency and accountability – and delivering the Scottish Government’s National Outcomes. Empowering Planning to Deliver Great Places, the 2016 report of the independent review of the Scottish planning system, acknowledges that “speed of decision making is an important part of performance monitoring”, but it also notes the “broad consensus on the need to refocus [development] plans on delivering outcomes rather than process”. This theme was picked up in the Scottish Government’s response to the review, notably the January 2017 consultation paper, Places, People and Planning, which proposed changes to the existing Planning Performance Framework (which focuses primarily on process) but also discussed the case for “measuring performance on the basis of quality of places”. The consultation revealed a consensus among policymakers, planners and third sector organisations that a new approach was required. The Policy Memorandum accompanying the Planning (Scotland) Bill noted the “strong support for a focus on monitoring quality of decisions and outcomes, as well as time-based performance standards”. This was the context for the 2018 research study, commissioned by the Scottish Government, on Monitoring the Outcomes of Planning. The aim of the research was “to identify how place-based outcomes from planning could be monitored”. This was an ambitious goal in itself, but the objectives of the study were not restricted to “place-based outcomes”. We were also encouraged to consider the long- term impacts of planning, both direct (better places) and indirect (contribution to other National Outcomes). impacts describe the medium to long-term effects of the planning system, which may be either (1) direct impacts on place quality, or (2) indirect impacts on wider economic, social and environmental goals. Monitoring – the collection of data before, during and after implementation – applies to inputs, activities, outputs and outcomes, all of which can be reliably quantified. Monitoring data form part of the evidence base for the evaluation of planning impacts. Evaluation is a qualitative process, which uses evidence from a variety of sources and expert judgement to undertake a systematic assessment of all aspects of an intervention’s design, delivery and results. The speed and results of planning decisions are useful measures of administrative efficiency but they require careful interpretation. Is speed always a virtue, especially if there is significant opposition to a proposal? Good planning means rejecting developments that are in the wrong place or fall short on quality grounds, but the PPF – like much of the policy discourse – is predicated on the implicit assumption that approvals are good and refusals are bad. We know from previous research on community engagement in planning that this is a source of deep frustration to community groups who believe that the system is already loaded in favour of developers, and that it does not do enough to deliver better place quality. So there is much to be said for shifting the focus from monitoring the planning process – though this is still important – to the on-the- ground outcomes and impacts of planning. It would have the merit of demonstrating the benefits (and shortcomings) of the planning system in terms that make sense to ordinary citizens, it would promote learning, and it would contribute to greater transparency and accountability. But we should not underestimate the challenges that adopting the new approach would present. A review of recent research leaves little room for doubt that applying an outcomes- based performance management model to planning is inherently difficult, especially if we are looking beyond direct spatial impacts to consider the wider effects on “health, wellbeing, sense of identity and prosperity”. finally, more wide-ranging evaluations should be undertaken to assess the impact of planning on the wider policy agenda and its contribution to National Outcomes. The report suggests that the expanded monitoring regime should be a comprehensive system, covering all applications except for minor works, and backed up by a national planning database which would enable more accurate and sophisticated reporting. Detailed guidance would need to be prepared for impact evaluation, both direct and indirect, and there was strong support for using the Place Standard to inform before-and-after analysis. The report also included recommendations for publishing and disseminating the lessons learned. Politicians, professionals and citizens will thus be able to test whether the core purpose of planning – to create “better places” in Scotland – is being achieved, and to better understand what works as well as what can go wrong. The study revealed a high level of interest in performance management for planning, as well as a keen awareness of the practical difficulties of developing and implementing an outcomes-based system. We benefited from the expert advice and insights of RTPI Scotland, HOPS, the Improvement Service, the Key Agencies Group and others. The broad principles set out here commanded strong support, but our consultations also revealed some scepticism about the Government’s commitment to such a far-reaching culture change, as well as concerns about the resource implications for already overstretched planning authorities of designing and implementing the new regime. The issues raised by the study go to the heart of the purpose of planning in a modern, progressive society. The priority now is to develop the principles set out in the report into a detailed, costed business model, and to produce a practicable and realistic implementation plan, including the role of the proposed national planning performance coordinator. That work should start now.